Why is NASA’s Commercial Crew Program to develop private human transport ships to low Earth orbit important? That’s the question I posed to NASA Administrator Charles Bolden when we met for an exclusive interview at NASA Goddard Space Flight Center in Maryland. 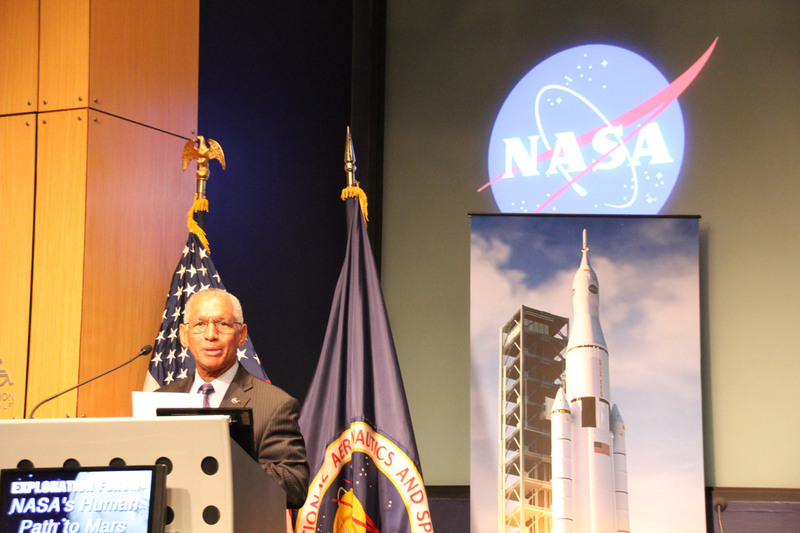 The Commercial Crew Program (CCP) is the critical enabler “for establishing a viable orbital infrastructure” in the 2020s, NASA Administrator Charles Bolden explained recently in a one-on-one interview at NASA’s Goddard Space Flight Center in Greenbelt, Md. Bolden, a Space Shuttle commander who flew four time to space, says NASA wants one of the new American-made private crewed spaceships under development by SpaceX, Boeing and Sierra Nevada – with NASA funding – to be ready to ferry U.S. astronauts to the International Space Station (ISS) and back to Earth by late 2017. Flights for other commercial orbital space ventures would follow later and into the next decade. Since the shutdown of NASA’s space shuttle program following the final flight by STS-135 in 2011 (commanded by Chris Ferguson), America has been 100 percent dependent on the Russians to fly our astronauts to the space station and back. “Commercial crew is critical. We need to have our own capability to get our crews to space,” Bolden exclaimed during a visit to the NASA Goddard cleanroom with the agency’s groundbreaking Magnetospheric Multiscale (MMS) science probes. Administrator Bolden foresees a huge shift in how the U.S. will conduct space operations in low earth orbit (LEO) just a decade from now. The future LEO architecture will be dominated not by NASA and the ISS but rather by commercial entrepreneurs and endeavors in the 2020s. Bolden and NASA are already looking beyond the ISS in planning how to use the new commercial crew spaceships being developed by SpaceX, Boeing and Sierra Nevada in a public partnership through NASA’s Commercial Crew Program. There are going to be other stations or other laboratories. But they won’t be NASA operated laboratories. They will be commercially viable and operating laboratories. The ongoing crises in Ukraine makes development of a new U.S. crew transporter to end our total reliance on Russian spaceships even more urgent. “Right now we use the Russian Soyuz. It is a very reliable way to get our crews to space. Our partnership with Roscosmos is as strong as it’s ever been. So we just keep watching what’s going on in other places in the world, but we continue to work with Roscosmos the way we always have,” Bolden stated. The latest example is the recent successful launch of the new three man Russian-U.S.-German Expedition 40 crew to the ISS on a Soyuz. Of course, the speed at which the U.S. develops the private human spaceships is totally dependent on the funding level for the Commercial Crew program. Unfortunately, progress in getting the space taxis actually built and flying has been significantly slowed because the Obama Administration CCP funding requests for the past few years of roughly about $800 million have been cut in half by a reluctant U.S. Congress. Thus forcing NASA to delay the first manned orbital test flights by at least 18 months from 2015 to 2017. And every forced postponement to CCP costs U.S. taxpayers another $70 million payment per crew seat to the Russians. As a result of the congressional CCP cuts more than one billion U.S. dollars have been shipped to Russia instead of spent on building our own U.S. crew transports – leaving American aerospace workers unemployed and American manufacturing facilities shuttered. “No Bucks, No Buck Rogers,” Chris Ferguson, who now leads Boeing’s crew effort, told me in a separate interview for RocketSTEM. NASA officials have told me that one or more of the three competitors will be chosen later this year in the next phase under CCtCAP to build the next generation spaceship to ferry astronauts to and from the ISS. Concurrently, NASA is developing the manned Orion crew vehicle for deep space exploration. The state-of-the-art capsule will carry astronauts back to the Moon and beyond on journeys to asteroids and one day to Mars. However, commercial crew spacecraft are critical to establishing the low Earth orbit infrastructure that is required for deep space exploration.